WASHINGTON Federal Reserve Chairman Ben Bernanke said Wednesday that even though the U.S. economy has improved in recent months, the Fed won't alter its aggressive stimulus policies until it is convinced the gains can be sustained. During a news conference after the Fed's two-day policy meeting, Bernanke repeated that the Fed plans to keep its key short-term interest rate near zero until unemployment is below 6.5 percent. But he noted that 6.5 percent is a "threshold," not a "trigger." He also said the central bank may vary the size of its monthly bond purchases depending on whether and how much the job market improves. It is currently spending $85 billion a month to help lower long-term rates. The unemployment rate has fallen to a four-year low of 7.7 percent, among many signs of a healthier economy. "We are seeing improvement," Bernanke said. "One thing we would need is to see this is not temporary improvement." The Fed's commitment to its low-interest rate policies drove stock prices higher Wednesday. The Standard & Poor's 500 index rose 10 points Wednesday end the day up at 1,558 - a few points shy of its record close of 1,565 on Oct. 9, 2007. 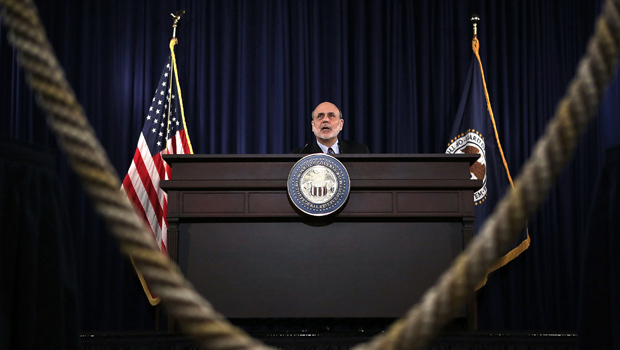 Bernanke downplayed concerns that the Fed's stimulus policies are inflating stock prices. "We don't see at this point anything that is out of line with historical patterns," said Bernanke. He noted that it is not surprising to see stocks rise given optimism about the economy and strong earnings reports. Bernanke, whose second four-term term as Fed chairman ends in January 2014, also avoided answering questions about whether he would consider staying on for a third term. His predecessor, Alan Greenspan, served as Fed chairman for more than 18 years. Bernanke said that he had discussed the issue with President Barack Obama "a bit." But he did not reveal any specifics from that discussion. He was asked whether he might consider staying at the Fed to manage the exit strategy, the period when the Fed reverses course and starts selling bonds and boosting short-term interest rates. "I don't think I am the only person in the world who can manage the exit," Bernanke said. "With respect to my personal plans, I will let you know when I have something more concrete."